I use Fusion a lot, and it does what I want and never gives me any problems. I was working for a client this week and had to VPN onto their network (172.16.0.0/16 but all the servers were on 172.16.48.x). When connected I could not RDP to any of their servers? I asked a colleague to try on his laptop and it worked fine? I asked another colleague who also uses a mac, his worked as well. At this point I noticed that 172.16.48.0 was set to send traffic to vmnet8, A quick Google search told me that this was used for VMware Fusion. 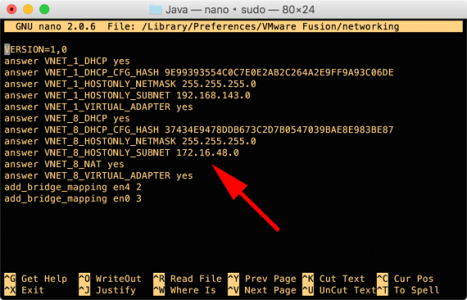 I quit Fusion, and it started working, which is fine, but I’d rather have Fusion running so how do I change the IP addresses it uses? In case you are thinking, the client was using 172.16.0.0/16 and Fusion was using 172.16.48.0/24 Why did it break? Well, as I said above, the servers were all on 172.16.48.x, and with routing the most specific route ALWAYS WINS.